Our garden has been invaded…by wild boar, jabali in Spanish. It’s obvious where; several patches of earth have been rummaged-around-in and tell-tale hoof scrapes can be seen. It’s like someone has come along intending to dig a hole to Australia and given up after 10 minutes. M tried to do the same thing as a kid in his back garden and at least made it down a metre or so. Boars – and they can be BIG – are very common here, coming out at night to forage for bulbs, roots and the like. If anyone knows if they like almonds and olives, please let us know as there are loads of them littered on the ground. A young almond tree has also been semi-uprooted. Boars don’t really like humans but we’re told you don’t want to stumble on one in the night, especially if they are cornered. Because they visit at night when we’re dreaming of sheep, the New York Stock Exchange (only kidding) and boiled sweets covered in sherbet, we have no idea if it was a lone boar that did last night’s damage or a gang of them – the Órgiva Boar Massive perhaps. A while back, the Olive Press reported that a man had been gored in the leg by a boar while out picking mushrooms. Wild boar are hunted here and we’ll write a post about it another time – including what becomes of them (blood, sweat, tears an’ all). The photo below is some of the evidence found a few metres from the back door. Also a film showing ‘wild’ boar being fed in Murcia, Spain – watch the little ones come dashing halfway through. And here is more about boars on Iberia Nature…and here is Notes on a Spanish Valley‘s post. My friends have this problem as well, dispite paying for various expensive fences the jabili still get in…they think they are after the acorns from the cork oak trees, but I don’t know…. We’ve been told that replacing fences is largely a waste of time. They come back to the same spot they normally get in and trash that regardless as to whether it’s a new fence. 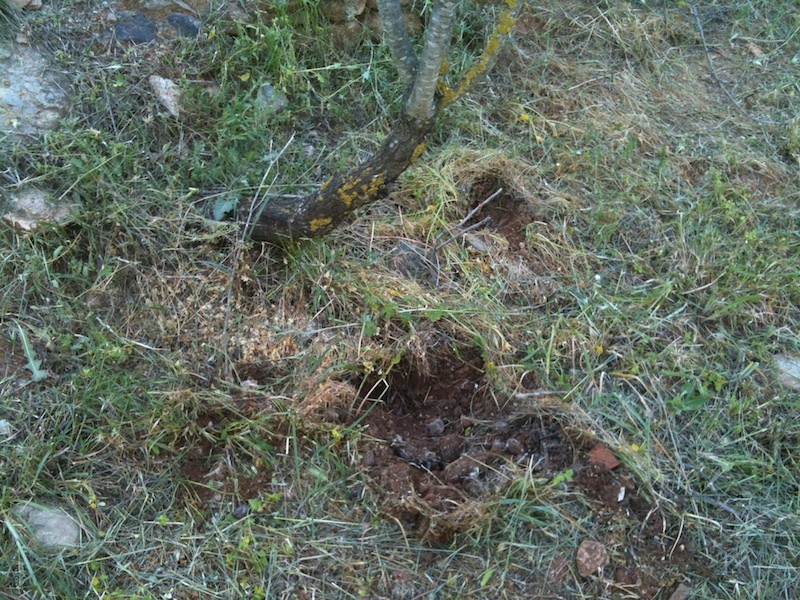 I live in the campo, and we regularly see evidence of wild boars in the area. I’ve never actually seen one, but often heard them They can be very destructive to flora and have bitten through our irrigation pipes on numerous occasions! Ah, that would explain the ragged pipes! I sure do love jabali…. on my plate, that is. It’s not something we seek out really but must try it. Those packet soups (just add water) turn our heads before we get to the meat counter.